An American fantasy drama television series created by David Benioff and D. B. Weiss. It is an adaptation of A Song of Ice and Fire, George R. R. Martin's series of fantasy novels, the first of which is A Game of Thrones. Set on the fictional continents of Westeros and Essos, Game of Thrones has several plots and a large ensemble cast but follows three story arcs. 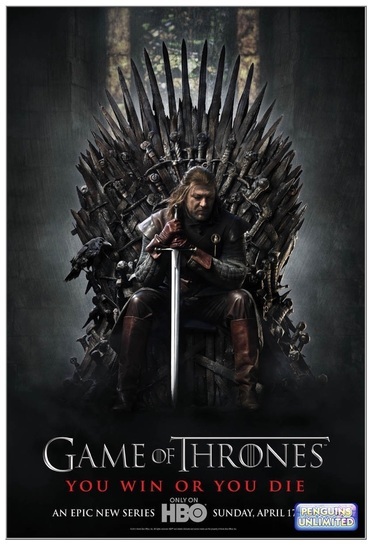 The first arc is about the Iron Throne of the Seven Kingdoms and follows a web of alliances and conflicts among the noble dynasties either vying to claim the throne or fighting for independence from it. The second story arc focuses on the last descendant of the realm's deposed ruling dynasty, exiled and plotting a return to the throne. The third story arc follows the longstanding brotherhood charged with defending the realm against the ancient threats of the fierce peoples and legendary creatures that lie far north and an impending winter that threatens the realm. The first season of the fantasy drama television series Game of Thrones premiered on HBO on April 17, 2011 in the U.S., and concluded on June 19, 2011. It consists of ten episodes, each of approximately 55 minutes. The story takes place in a fictional world, primarily upon a continent called Westeros, with one storyline occurring on another continent to the east known as Essos. Like the novel, the season initially focuses on the family of nobleman Eddard Stark, who is asked to become chief advisor to his king and longtime friend, Robert Baratheon. Ned must find out who killed the previous Hand of the King, Jon Arryn, while trying to protect his family from their rivals the Lannisters. He uncovers the dark secrets about the Lannisters that his predecessor died trying to expose. Meanwhile, in Essos, the exiled Viserys Targaryen, son of the former king, believes he still has the rightful claim to the throne.